Policy Change. Cancer Schmancer was instrumental in passing 2007's Gynecologic Cancer Education & Awareness Act -- by unanimous consent -- the first of its kind in US history, and Fran was named one of the Top 5 Celebrity Lobbyists by Washingtonian Magazine. Our latest drive encourages consumers — especially young people — to use the power of the purse to dictate responsible manufacturing trends. If you stop buying harmful products today, manufacturers will stop making them tomorrow. I am a uterine cancer survivor, but was misdiagnosed and mistreated for a peri-menopausal condition I didn't have. My doctors told me I was experiencing symptoms because of a long list of reasons – I was too young, too thin, even eating too much spinach! I was prescribed hormones to treat the symptoms, but my doctors didn’t order the proper diagnostic tests. At the time, I didn’t know to ask why or why not, because I was just happy to be told I was too young for something! But finally after an endometrial biopsy, my greatest fear was confirmed; I had cancer. It took me two years and eight doctors before finally being told I had a gynecologic cancer. I felt betrayed not only by my own body, but by the medical community. In 2002, I wrote Cancer Schmancer, to tell my story of survival so what happened to me wouldn’t happen to others. After I went on my book tour, I realized that what happened to me had happened to so many women like me. And so it was then I realized the book was not the end but rather the beginning of a life mission to improve women's healthcare in America. 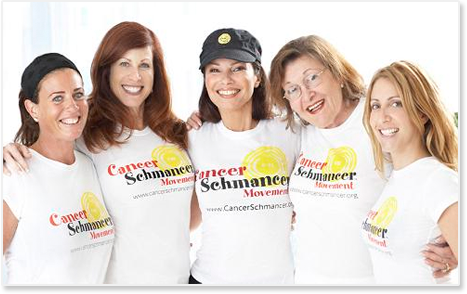 Toward this end, I have started the Cancer Schmancer Movement and Cancer Schmancer Foundation to transform women from patients into medical consumers, and to shift this nation's priority from searching for a cancer cure towards prevention and early detection of cancer. We need to take control of our bodies, become greater partners with our physicians and galvanize as one to let our legislators know that the collective female vote is louder and more powerful than that of the richest corporate lobbyists. As Frederick Douglass said, "Power concedes nothing without demand. It never has and it never will." I got famous, then I got cancer, and now I live to talk about it. Sometimes the best gifts come in the ugliest packages. Please lock elbows with me and join the Cancer Schmancer Movement so together we can do what needs to be done, so fewer of us will die prematurely. It's time to put on your sun block and get ready for a new dawn!